The first, larger column contains the index of your guides. 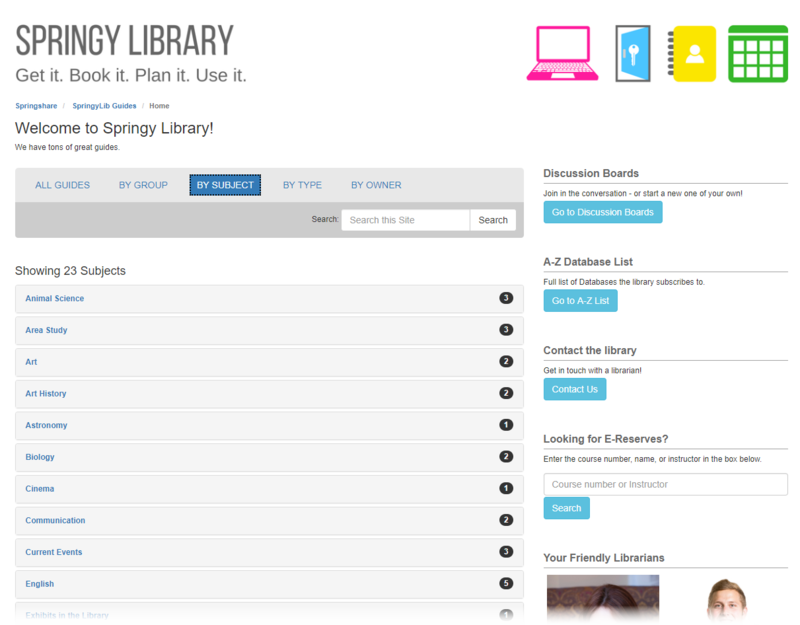 The second, smaller column contains different boxes highlighting other content, such as your blog, A-Z Database List, or librarian profiles. Default View: this sets the default guide list users see when visiting your homepage. For example, if you select "Subject List", then the "By Subject" view will display by default. Boxes: you can add, remove, and reorder boxes in the second column of the homepage. Welcome Message & Introductory Text: this allows you to customize the page title and description. Featured Profiles: this is where you can choose which librarian profiles to highlight in the "Your Friendly Librarians" box. Help is Just a Click Away: this is where you can customize the text of the button in the "Help is Just a Click Away" box. The Default View option determines which guide list users will see when first visiting your homepage. For example, if you select "Subject List", then the "By Subject" view will display by default. Users can still switch between the different views (e.g. By Owner, All Guides, etc.) once the homepage loads. In the Homepage Boxes / Redirect panel, use the Default View option to select your preferred default homepage view. Guide List: this will display the "All Guides" list by default. Subject List: this will display the "By Subject" list by default. Guide Type List: this will display the "By Type" list by default. Guide Owner List: this will display the "By Owner" list by default. 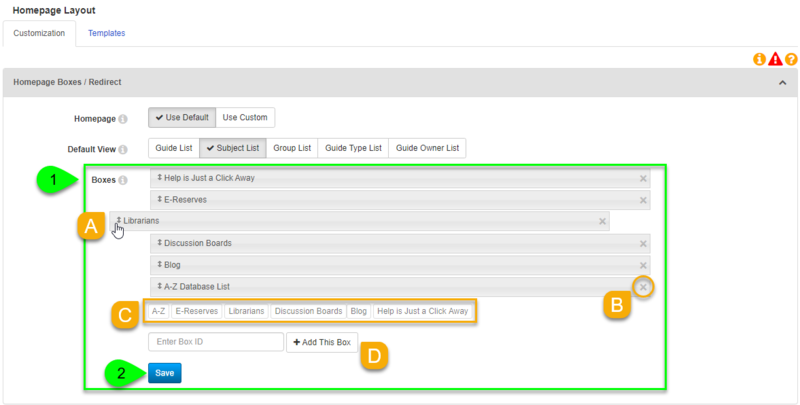 Group List: if you have CMS, then choose this to display the "By Group" list by default. If you are using a custom homepage template (i.e. not the "System Default - Homepage" template), the default view must be set within the template's Keyword Parameters. Simply edit your homepage template, select the desired view from the content : content list keyword parameter, and save your template. You can add, remove, and reorder boxes from the second column of the homepage. This includes several default boxes that provide your users with quick access to your A-Z Database List, blog, staff profiles, discussion board (if you have CMS), and E-Reserves homepage (if you subscribe to E-Reserves). However, you can also add any box you'd like from your guides. 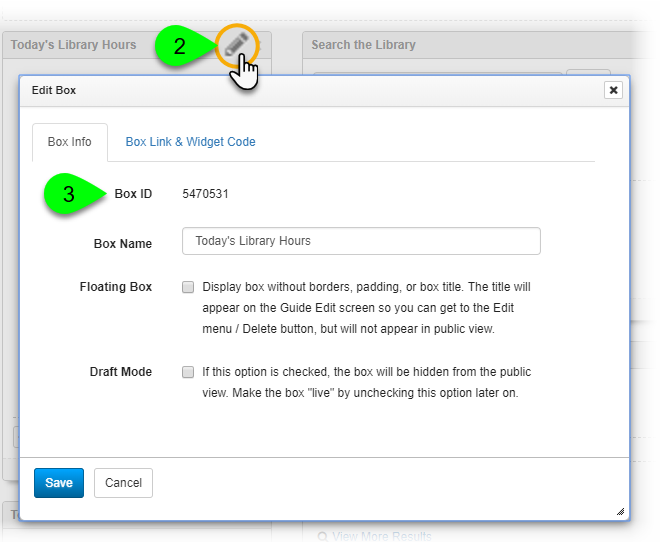 For example, if you created a box containing your library hours, you could add that to your homepage, as well. 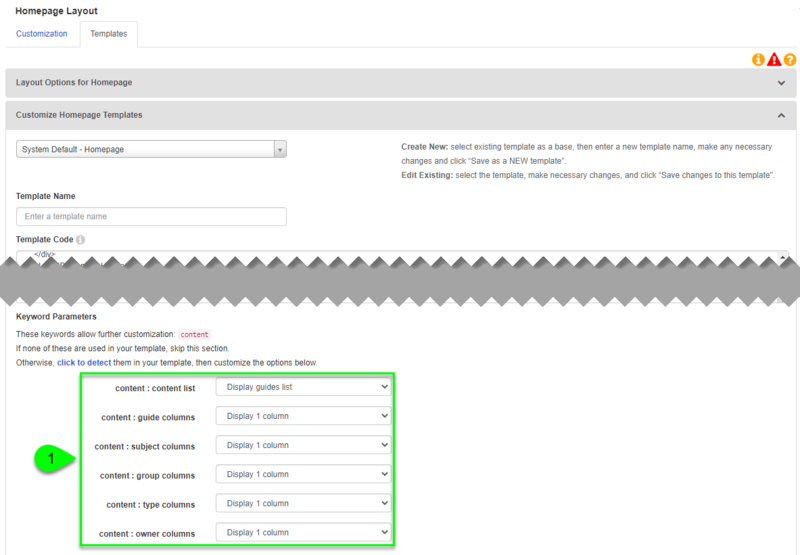 In the Homepage Boxes / Redirect panel, use the Boxes options to manage the boxes on your homepage. Click and drag any box to reorder it. The homepage will display the boxes in the same order as they appear here. To remove a box from your homepage, click on its Delete () icon. To add one of the available default boxes (such as A-Z or Blog), click on its button below the list of boxes. To add a box from one of your guides, enter its ID number in the Enter Box ID field and click the Add This Box button. The new box will appear in your list just like the default boxes. You can reorder it the same way you do any other box. If you remove the box, you can always add it back later by entering its ID again. When finished making your changes, click the Save button. Edit the guide and navigate to the page containing the box. Click on the Edit this Box () icon in the box's heading. In the Edit Box window that appears, you'll find the Box ID listed under the Box Info tab. The Welcome Message and Introductory Text fields allow you to customize the title and description at the top of your homepage. These are entirely optional: if you do not want to display any text, you can leave both fields blank. In the Welcome Message & Introductory Text panel, click on the underlined text to customize the text. Welcome Message: this appears as the page title in an <h1> element with a font size of 24px. This will display below your page header/banner and bread crumbs. Introductory Text: this appears as the page description a <div> element with a font size of 12px. This will display below the Welcome Message. The Featured Profiles setting allows you to customize which user profiles appear in the Your Friendly Librarians box on the homepage. In the Featured Profiles box, click inside of the text field. Select the users you want to add from the dropdown menu. To narrow the list, you can start typing a name right into the text field. If you do not select any users: each time someone visits the homepage, they'll see 4 profiles selected at random from all available users. If you select between 1 and 4 users: those same profiles will appear each time someone visits the homepage. If you select more than 4 users: each time someone visits the homepage, they'll see 4 profiles selected at random from that list of users. If you have LibGuides CMS, please note that this setting only applies to your system-level homepage. Groups have their own Featured Profiles setting for their homepages. To remove a user, click on its Delete () icon. The Help is Just a Click Away box allows you to provide instructions for contacting the library for help. If you subscribe to LibAnswers, the button in this box will automatically be configured to take users to your LibAnswers homepage, where they can search your FAQs, fire up a chat, or send in a ticket. However, if you don't have LibAnswers or would prefer to direct users to a different page, you can configure the button to use a different URL. In the Help is Just a Click Away box, click on the current URL in the Button URL to edit it. Want to also change that box's heading, body, and button text? You can do this under the Language Options tab. 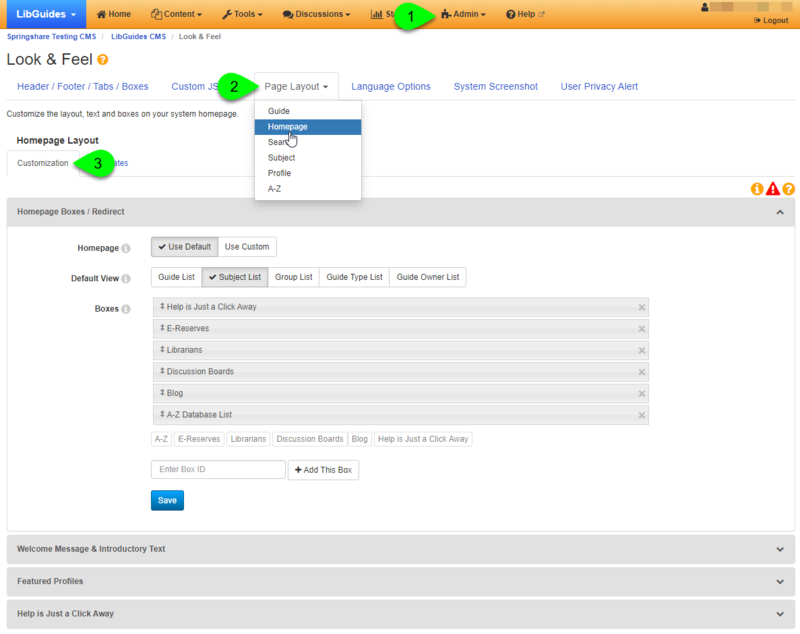 Under Language Customization, click on Global and modify Key IDs 34, 168, and 169.